Obituary for Robert P Collins | Boucher Funeral Home, Inc.
Robert P. Collins, 84, of Gardner, died peacefully Saturday, January 19, 2019 in his residence, surrounded by his loved ones. Robert was born in Portsmouth, NH on October 8, 1934, the son of the late William and Mildred (Cox) Collins. 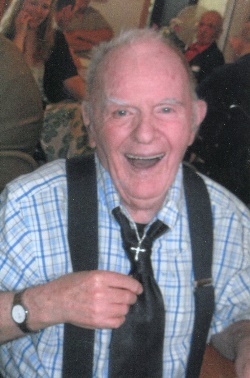 He was a member of Annunciation Parish/Our Lady of the Holy Rosary Church of Gardner. Robert enjoyed baking, singing, attending Mass and going to the beach. He loved all sports, and he loved spending time with his friends Bill and Virginia Luce, Dean Mattson and the love of his life, Carol. Besides his parents, Robert was also predeceased by his sister, Marion Collins. He leaves behind many friends at Clark Street. Funeral Services will be held Wednesday, January 30th at 12:00 p.m. in the Boucher Funeral Home, Inc., 110 Nichols Street, Gardner. Burial will be in Wildwood Cemetery, Gardner. A calling hour will be held Wednesday, January 30th from 11:00 a.m. to 12:00 p.m. in the funeral home. Memorial contributions may be made to GGARC, c/o Richard Spencer, 14 Leominster Street, Westminster, MA 01473. Please reference in memory of Robert P. Collins.